You may have seen this image circulating this week, and we’re sorry to break it you, but it was all a marketing stunt rather than the discovery of a real-life incredible hulk. 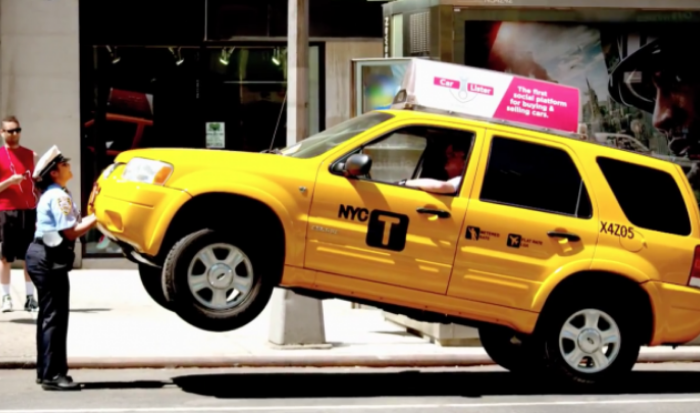 A rude cab driver was certainly taught a lesson and unsuspecting pedestrians were in for a shock with this heavyweight prank from car-selling app CarLister.co. After a cab driver refuses to move his vehicle when asked by this diminutive traffic warden, she takes it upon herself to move it – by lifting it up, much to the shocks of passers-by. The car at first glance looks like an ordinary New York City cab, but was created to be ‘lift-able’ and illustrate just how easy it is buy and sell cars on CarLister.co. The taxi actually only required a small amount of upward force on the front-end to be lifted. The engine as well as other components in the front of the car had to be taken out and the back tyres filled with gravel to make it ‘lift-able’. The message behind the stunt was: “That was easy. It’s just as easy to buy and sell your car”. The stunt was orchestrated with the help of the same group of creatives that was responsible for the unforgettable Carrie stunt, in which a girl unleashes her magical powers on a man in a coffee shop after he spills coffee on her laptop.